The Christmas decorations are back in the basement, the house is cleaned up, and the extra chocolate hidden away. Alexandra is back in California and Caroline is getting ready for her final semester and I’m left with the happy memories of a beautiful Christmas with 27 dear relatives and many friends. It is hard to go back to a quiet house in these cold days of winter so I’ve turned to some of my dearest old friends to keep me company by the fire. 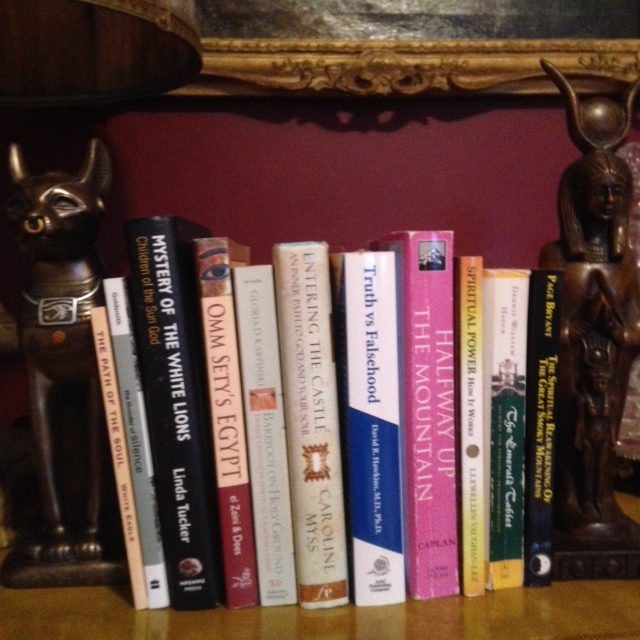 I want to share with you some of my favorite books from my library. Some may be familiar to you too or some might start a new thread in your life. This is the time to plant new seeds for the year. One of my best gifts from my teachers is an introduction to the classic spiritual writers. These older book aren’t well known but hold beautiful teachings that stand the test of time. The Path of the Soul: The Great Initiations by White Eagle. A channeled book first published in 1959 this book describes the four initiations all seekers must take along the path, Earth, Air, Fire and Water. In my last post on the Magic Flute, our hero takes two of these initiations on his path of love. The Thunder of Silence by Joel Goldsmith. Joel Goldsmith was the founder and teacher of The Infinite Way, a path of practical mysticism. His style is a bit dated but the truth his speaks is timeless. All of his books are gems. We can all use a compelling story in the middle of winter to inspire us. These are both true stories. The Mystery of the White Lions by Linda Tucker. I wrote about this book on my post The Ultimate Grand Supreme. This book has some twists and turns that help unravel a deep connection to our ancient past and our closest star Sirius. Omm Sety’s Egypt by Hay el Zeini and Catherine Dees. I bet you can’t put it down. Omm Sety was a very mysterious English woman who lived simultaneously in modern and ancient Egypt. Everyone’s path is unique but the road signs and obstacles are the same so here is some help. Barefoot on Holy Ground; Twelve Lessons in Spiritual Craftsmanship by Gloria Karpinski. A well written book by a great spiritual teacher. Honest and useful tools for the road ahead. Sometimes we need to do something besides play on rainbows with unicorns so here are some books to make sure we get our work done and keep moving forward up the mountain. If you want a game changer check these out. Truth Vs Falsehood; How to Tell the Difference by David Hawkins. A must read for all spiritual seekers because discernment is as vital as water and air on the path. Then read his other books, not easy but important. Halfway Up The Mountain; The Error of Premature Claims of Enlightenment by Mariana Caplan. It is so easy to get too eager and run up the easy slopes and then there is no energy for the hard climb. This book must go in your backpack along with your pick ax and oxygen tank for the snowfields. Spiritual Power; How it Works by Llewellyn Vaughan Lee. After you have gone through some initiations and realize you know absolutely nothing then you are ready for the GRE into graduate school. You will never make it if you don’t understand spiritual power so get studying. The Emerald Tablet; Alchemy for Personal Transformation by Dennis William Hauck. My poor copy is warped, marked and worn from reading by the pool, in the car, on a train, in a plane. No seriously, one of the best books on Alchemy and even readable. You know how I love Thoth and the Emerald Tablets. Bonus Book. 11 is a master number so I had to add an extra. The Spiritual Reawakening of the Great Smoky Mountains by Page Bryant. This book is by my dear friend and teacher and about the magical place on earth I’m lucky enough to call home. Page is a master of earth and star energy and she has written the guide book to the wisdom of these ancient mountains. This entry was posted in Authors, Books, Christianity, Egypt, Teachers by theperpetualpilgrim. Bookmark the permalink.